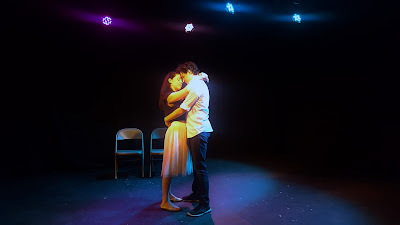 Written and directed by Ethan Ness, Die For Me is a stylized play of teen angst and the lengths one goes for the one they believe they love. Ness’ material is heavy. Boy and girl fall in love. Boy and girl deal with the stresses of life. Boy and girl make a pact to die for each other and kill themselves. Die For Me is a promising premise that falters when it goes astray. Ness blends a poetic dialogue into a colloquial tale. Rather than making the sole focus on Allie and Reese's romance, we see the stresses of life and how it can take a toll on the human psyche. We watch as Reese handles the rejection after low grades. We watch as Allie deals with a neglectful father. For the most part, Ness incorporates voiceovers to act as occasional scene partners. But there is still one party present. By making Gerald, Allie’s dad, an actual character, the play and the style loses emphasis. Why is Allie's father scene and not Reece's parents? Ness must decide whether this play desires a complete adult presence through voiceover or have an actor or actors represent these voices physically. Die For Me will also benefit from a fresh collaborator. It's clear that Ness is quite close to his script. An extra set of eyes is always helpful. There were inconsistencies in transition vocabulary. Some would feature a music cue; other transitions were completed in dead silence. And the latter was not ideal. That being said, simplifying the world with two chairs allowed the story to take main focus. Teenagers make rash decisions. But that is not just what Die For Me is about. This play is about the lengths you go for your love and the bond between two people. The premise may not be fresh, but Ness’ voice sure is.